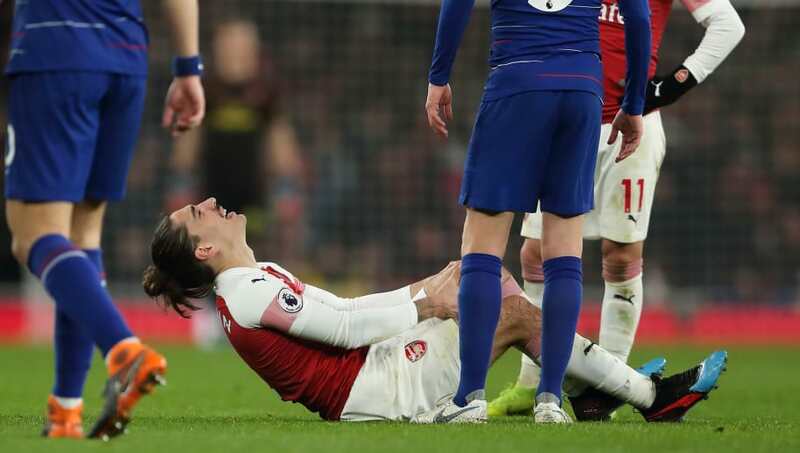 ​Arsenal have provided an update over the injury Héctor Bellerín suffered against Chelsea on Sunday that saw the Spaniard stretchered off the field after appearing to damage his left knee. The speedy right-back collapsed onto the ground in agony midway through the clash against the Blues, and it quickly became apparent that the injury was more than a mere knock. Arsenal have suffered from a host of defensive injuries this season, with manager Unai Emery struggling to keep the same back line on the field for more than a couple of matches. Speaking to the ​Gunners' ​official website, Emery gave an update on Bellerín's condition, stating: "We are going to wait until tomorrow. It is his knee and the first prediction maybe can be an important injury. Tomorrow we will speak with the doctor. I hope not, but it is not very positive, our first impression." Discussing his options for a replacement, Emery claimed: "We have Ainsley (Maitland-Niles). He is playing with good pieces, today also he played well. He can help us by playing like a right back or a winger. And also, Lichtsteiner is another player; I think we have players. I don't forget Jenkinson, because he played some matches, and if we need (him), he is okay to help us." The Gunners will be desperate to have Bellerin back as soon as possible, but it appears that he could be set to spend a good proportion of the remaining season on the sidelines. ​Arsenal's win over the Blues puts them back in contention for a top four finish, in what looks set to be an enthralling battle for Champions League qualification between a number of top sides. Meanwhile, ​Emery insisted that his side shouldn't get carried away following their victory, and said he'd be taking it one game at a time. The former Paris Saint-Germain boss claimed he was delighted with the result, but outlined his intention for his side to play well with more consistency - especially in matches away from home.